Tonight, eight Street Fighter V pros will face off in the Eleague play-offs and finals, which you can watch on TBS or via digital live stream. By the way, there are also two other Street Fighter V competitions happening this weekend as well—Combo Breaker 2017, a premier tournament in the Capcom Pro Tour series, and Red Bull Kumite 2017, an SFV invitational featuring two of Eleague’s finalists in the lineup. It’s a busy weekend for the best of the best SFV players. But the weekend won’t be as busy as it could have been for Victor “Punk” Woodley, a teenaged SFV phenom who has won two Capcom Pro Tour premier tournaments back-to-back this year. His high-level Karin plays make him the contender to watch during tonight’s Eleague event. His finalist status is bittersweet, however, because the scheduling of the event means that Punk won’t be able to participate in Combo Breaker this weekend. Oddly enough, the Capcom Pro Tour site still lists Punk front and center in its Combo Breaker promotional post. He won’t be showing up, but you can’t blame anyone for wishing he could be in two places at once. Punk is currently first on the Capcom Pro Tour global rankings, so he’s the guy to beat these days. With his current score, he’s all but guaranteed an eventual shot at the Capcom Cup. Because of that score, he doesn’t really need to compete in this weekend’s Combo Breaker in order to rack up more CPT points. But it’s gotta be a disappointment for the Combo Breaker attendees that they won’t get to see Punk do his thing. It would feel “fair” to see Punk win first place in Eleague, since he gave up participating in a CPT premier event for it. Since Eleague’s invitational competition isn’t part of the Capcom Pro Tour, the players who participate don’t earn any points towards eventually qualifying for the Capcom Cup. They could win Eleague’s prize money, which is nothing to sneeze at given the top prize is $150K, but Eleague doesn’t have the same cachet as the Capcom Pro Tour. 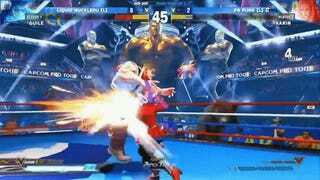 The player who wins the Capcom Pro Tour, and the overall rankings gleaned from that tournament circuit, are the way that the “best” Street Fighter players get determined. Invitational events like Eleague are just gravy. While we’re talking about wins that would feel “fair” in a narrative sense on Eleague tonight, let’s recall the plight of Joshua “Wolfkrone” Philpot. Wolfkrone’s situation is much dicier than Punk’s, since he hasn’t participated in very many Capcom Pro Tour events yet. He placed 13th in a premier event last March, but needs a lot more CPT points in order to increase his overall standing. It’s entirely possible that he’d earn them if he’d had the chance to participate in Combo Breaker this weekend, since he’s been doing so well on Eleague that he made top eight. However, because of those successes in Eleague, he’s sacrificed his chance to secure another premier event win. With an underdog story like that, you’d think everyone would be rooting for Wolfkrone tonight—but that’s not necessarily true. Talented as he is, Wolfkrone is not that popular these days, thanks to the tough persona he’s cultivated over the past few months. It all started with a heated rivalry between Wolfkrone and K-Brad that involved a lot of trash-talk and some in-person arguments at tournaments earlier this year, and later, came to a head on Eleague. When Wolfkrone found out about the Combo Breaker scheduling issue, he withdrew his registration and blocked the tournament organizer on Twitter, as opposed to just waiting to see if he happened to get chosen for Saturday pools or not. Given that backstory, it could be compelling to see how Wolfkrone plays tonight. Much like Punk, this is his only SFV event all weekend. Unlike Punk, Krone could use a win, even if it just amounts to prize money and not CPT points. Speaking of unexpected underdogs, Street Fighter veteran Daigo Umehara also made it into the top eight on Eleague, in spite of the fact that his chosen character Ryu has not been as well-balanced compared to other characters in SFV this season. The next patch for SFV has been delayed until May 30, with further balance patches to follow, all way too late for Daigo to switch back and win it all. Over the past few months, Daigo has made a character switch to Guile, and it’s been a wild ride seeing him playing with a completely different character and, eventually, make it into the top eight of Eleague. Because of his journey over the past few months, many fans are rooting for Daigo to win it all, against all odds. Just as it’s compelling to see a young guy like Punk appear out of nowhere and win a ton of tournaments, so too is it nice to see an older wiser pro like Daigo proving that he can still adapt and win against the youths. And, of course, the other five players in the top eight bracket tonight will pose a threat as well. It all depends on who’s having an off day or not. But personally, I’ll be keeping an eye on Punk, Wolfkrone and Daigo tonight. My hypothetical money’s on Punk.